Panaji: The Goa government issued show-cause notices to two senior state health department officials for “dereliction of duties”. The notices were issued to Director of Health Services, Dr Sanjiv Dalvi, and Dean of Goa Medical College and Hospital, Dr Pradeep Naik. The action was initiated following a visit paid by the parliamentary committee to Goa Medical College and Hospital (GMCH) earlier this week. Talking to PTI over the development, state health minister Vishwajit Rane said that during the visit of parliamentary committee it was noticed that the condition of the GMCH was shabby. “The curtains were torn, and the bathroom was overflowing inspite of the house keeping agency being in place. It only showed that the dean was not taking rounds of the hospital,” he said. The minister said that certain places were completely dark and in a very bad condition. “The dean has been given power of spending up to Rs 15 lakh (for the development work), but he has not used them. He has been shifting blame on other government agencies. 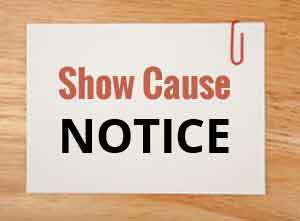 Hence show cause notice was issued,” Rane said. A source in the department said that Naik was issued a show-cause notice for showing lack of interest and not taking initiative during the visit of the parliamentary committee. The department also asked Naik to submit a detailed statement of the expenditure in the last two years made by him from the financial powers allotted to him. Dalvi was asked to explain the unreasonable delays in finalising of various tenders, the source added. “It has been observed that various tenders are pending for a very long time in some cases even for more than 2 to 3 months. Such unreasonable delay hampers the functioning of the department,” a senior official said. Both of them have been asked to submit their detailed replies in the matter by October 31.